To jump the shark: The precise moment when you know a program, band, actor, politician, or other public figure has taken a turn for the worse, gone downhill, become irreversibly bad, is unredeemable, etc. ; the moment you realize decay has set in. In the reporting and investigation of UFO sightings, MUFON strives to use the scientific method....In order to augment scientific research into the study of the UFO phenomenon, MUFON created a Science Review Board (SRB) in 2012. The SRB consists of 8-9 scientists with backgrounds in electrical engineering, physics, chemistry, geology, biology, computer science, and astronomy. And what exactly does MUFON serve up from its precious archives? 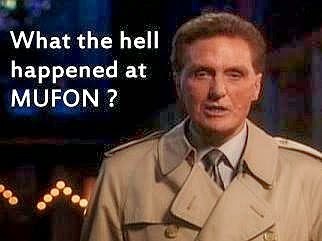 Some of the most preposterous, unsubstantiated stories in the UFO literature. . . .
What Caused the Failure of the BAASS - MUFON SIP Program ?